Khajuraho is a city with abundant options to keep every enthusiast happy. Right from history, architecture, nature, and heritage to sports, it has something to offer to visiting tourist. Sport is an integral part of Khajuraho recreational activities as it becomes way for people to bond and come together. Right from playing cards on street corners to gully cricket by young kids, these events help bring societies and communities together. Like any other part of India, Khjauraho also has a healthy cricket following. But Khajuraho has much to offer beyond just cricket. Khajuraho has a wide interest base in football, volleyball, swimming, archery etc. 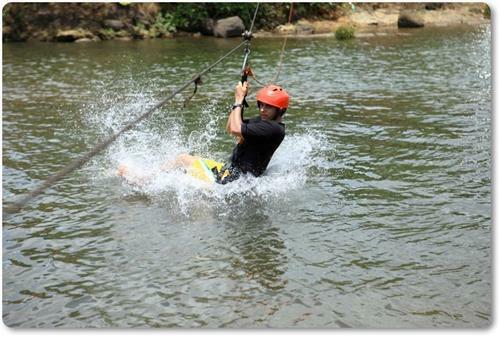 Recently, as a part of tourism promotion by the state tourism department, adventure sports have been introduced as a part of the tourist attractions in the city. Adevnture sports have taken center stage in recent times in Khajuraho as an effort to provide a well-rounded experience to the tourists who visit here and also to provide them with newer attractions to keep them engaged. The Beni Sagar dam and the lake impounded by the dam are the locations where these activities are usually conducted. The adventure sports festival usually happens on the sidelines of the Khajuraho dance festival, which sees wide attendance from people across the globe. Some of the sports which are organized as a part of the festival are Hot Air balloon, Para Gliding, Parasailing, Water Surfing, Banana ride, Ringo ride, Rock climbing, Rappelling, Valley crossing, Zorbing, Gun shooting, Archery, Tunnel crossing etc. The idyllic beauty of the Benisagar reservoir and the exciting adventure sports makes it an ideal combination to indulge in when in Khajuraho. These sports are very popular amongst the international tourists who are always looking for ways to enhance their Indian experience. Apart from this, even local tourists throng the places during this season to take part in numerous sporting events. Like any other part of India, Khajuraho also has very high involvement with the sport of Cricket. Not only does every child in schools and street corners play it, young kids have also started participating in district and state level teams. The city has numerous unofficial cricket clubs, which cater to the needs of training and coaching young cricket enthusiasts. The sport is well followed and also enjoyed across the countryside and this is because of the national iconic status the sport enjoys in India.Tennis also enjoys good patronage in the city and this is due to the European influence due to the constant flow of European tourists who visit Khajuraho every year. The city has professional grounds for tennis and also has numerous avenues for training professionally under certified trainers. Khajuraho has lately started promoting holistic health and alternate avenues for promoting a healthy lifestyle as a part of the tourism development project. Because of the ideal location in the midst of the spiritual temples, old world charm and mystic quality of the city, yoga is a well known art which has been followed here since age old times. There has been an effort to revive the art and pass on the traditional knowledge to more and more people. Various yoga studios and yoga practitioners have come up in the city and most of them belong to reputed schools of yoga and follow the old traditional knowledge of yoga. The popularity of yoga trainers of Khajuraho is so immense that there are many tourists who come to Khajuraho mainly to learn the art of yoga and attain good quality of life.